DuPage County property owners again can expect to pay higher taxes on land that's worth less than it used to be. DuPage officials on Tuesday announced the average tax rate for the county's 384 taxing bodies increased 9.36 percent. Meanwhile, the overall value of land in DuPage — the other half of the tax equation — fell last year by 5.4 percent, to roughly $32.7 billion. As a result, property owners across DuPage are going to pay an average of 3.96 percent more on their tax bills, which are due in equal installments in June and September. "You are paying more because your districts asked for more (tax money)," County Clerk Gary King said. The fact is that some of the 'empire builders' who run these local governments are out of control and can't rein in spending - even in light of lower property values'. We spotted this on our Facebook feed this am and because a few of the members of the Illinois Truth Team Editorial Board live in DuPage County, we have to say we're interested to see what transpires when it comes to DuPage County taxes. Frankly, we were were pleased to see this. 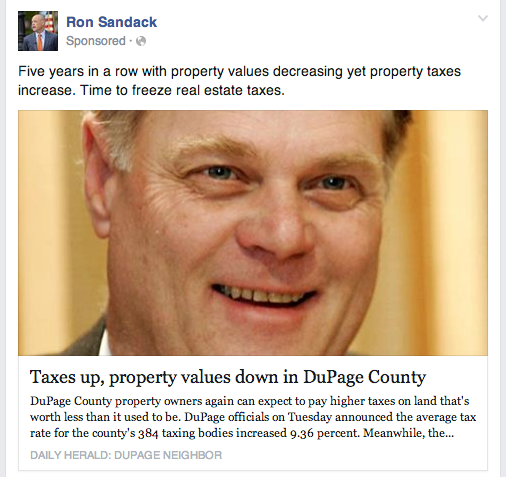 If State Representative Ron Sandack wants to "Go to the Mattresses" on Property Taxes, we'll stand right behind him the whole way. Thankfully, common sense prevailed in March and we sent Ron Sandack back to Springfield to fight for things like this. Let's get after it, Ron.